Which Buddha is your Birthday Buddha? In Thailand, we have a different Buddha allocated, with its own image for each day a person is born on. 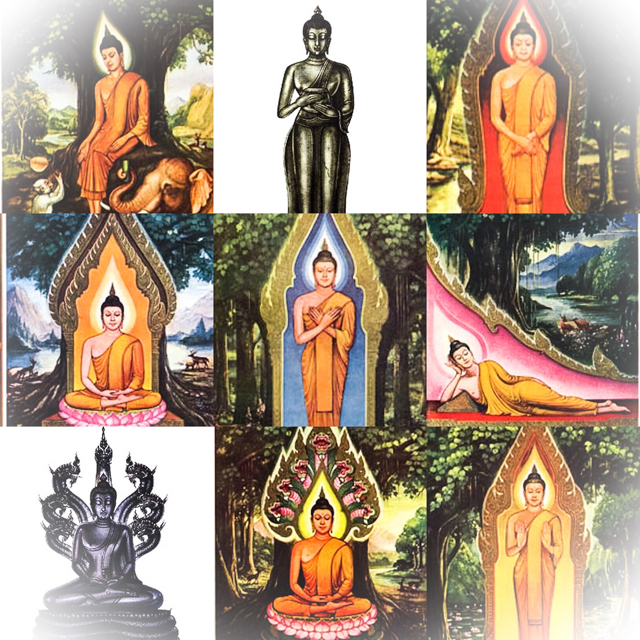 You can see all of these different postures of Buddha-Rupa Images in Thai Temples. Some temples have them all arranged alongside each other as a prayer shrine, with an alms bowl in front of each of them lined up in a row. This is for you to donate the allocated amount for each Birthday (the amount is different depending on which day you were born on. There is one Buddha for each Birthday, with the exception of those born on Wednesdays, which has two Buddhas; one for the daytime and one for the night time, so you should know whether you were born in the daytime or evening to revere Wednesday’s Buddha. Monday Buddha; Pra Um Badtr (Holding Almsbowl), Tuesday; Pra Saayaas (Sayasana – Reclining Buddha), Wednesday Daytime; Pra Um Badtr, Wednmsday Evening; Pra Welalai, Thursday Buddha; Pra Prok Po,, Friday Buddha; Pra Rampeung, Saturday Buddha; Pra Nakprok, Sunday Buddha; Pra Thawaay Naedtr. Sunday Buddha is called “Bpang Taway Netr” (ปางถวายเนตร) – meaning “stance of offering his eyes” This name comes from when the Buddha attained Enlightenment under the Bodhi tree and became “Samma SamPutta Jao” (Arahant), he spent a period of seven days enjoying the experience of his enlightenment, after which he arose and stood in the eastern side staring at the Bodhi tree without blinking for seven days. This position of standing Buddha is considered a great blessing to those who rever it. The dispute became so great that they sttarted killing each other one on one.The situation escalated to the point where the rulers of each of these two Cities (who were both relatives of the Buddha), mustered their armies and went into battle with each other. When the Buddha heard the news of this incident, which should have been discussed and solved easily using wise and peaceful discussion, he travelled to the scene of the incident to forbid the quarrelling. He explained to them of the loss of population of their respective people and the loss of honor of each Royal Family which was coming from such a war, that was causing such terrible loss to each side and perhaps even that both Kings would even end up falling and dying in battle simply because of a bit of river water used for some farming. This stance represents the scene just before Buddha entered Nirvana and passed away from his physical body. As the moment of his death approached, Buddha laid down on his side, with his left hand on his leg and propped up his head using his right hand. His closest companion and friend, Pra Ananda then asked him “Oh Lord, what will we do when you are gone? Even with you here the Human race is so difficult to teach and explain the Dharma to, as you have often remarked yourself. For they are so stubborn?” The Buddha then gave his last Sermon before entering into Contemplation of the fourth jhana to enter Nirvana, and said ; Buddha’s First Sermon and Last Words. Then the Blessed One addressed the Venerable Ananda: ‘It may be, Ananda, that to some of you the thought may come: “Here are (we have) the Words of the Teacher who is gone; our Teacher we have with us no more”. But Ananda, it should not be considered in this light. What I have taught and laid down, Ananda, as Doctrine (Dhamma) and Discipline (Vinaya), this will, be your teacher when I am gone. ‘Just as, Ananda, the bhikkhus now address one another with the word “Friend” (Avuso), they should not do so when I am gone. A senior bhikkhu, Ananda, may address a junior by his name, his family name or with the word “Friend”; a junior bhikkhu should address a senior as “Sir” (Bhante) or “Venerable” (Ayasma). ‘If the Sangha (the Community, the Order) should wish it, Ananda, let them, when I am gone, abolish the lesser and minor precepts (rules). When this was said, the bhikkhus remained silent. A second time and a third time too the Blessed One addressed the bhikkhus … as above. The bhikkhus remained silent even for the third time. Then the Blessed One addressed them and said: ‘It may be, Bhikkhus, that you put no questions out of reverence for your Teacher. Then, Bhikkhus, let friend speak to friend.’ Even at this, those bhikkhus remained silent. Wednesday Buddhas (there is one for Daytime, and one for Night Time, depending when you were born) The first (Daytime), depicts the Buddha holding an Almsbowl. 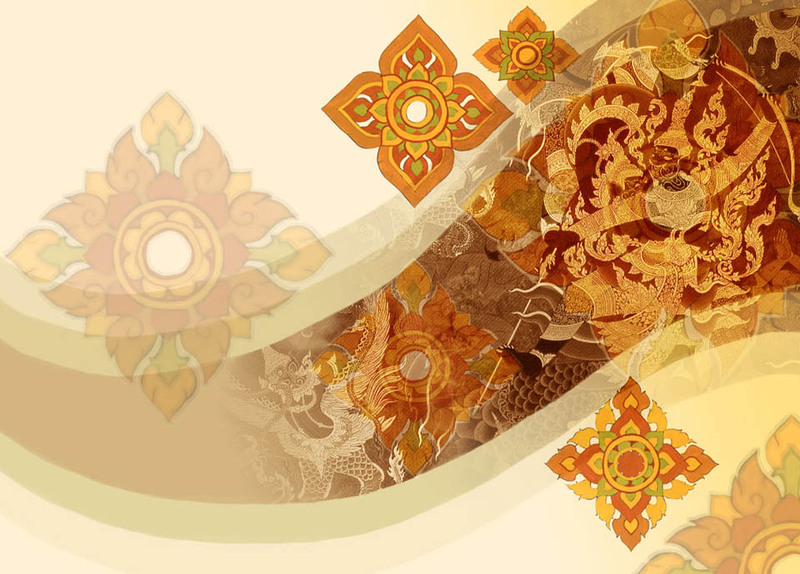 This “Bpaaang” is derived from an event where a Miracle occured (Paadhihaariya , called “Idtibatiharn”, in Thai). 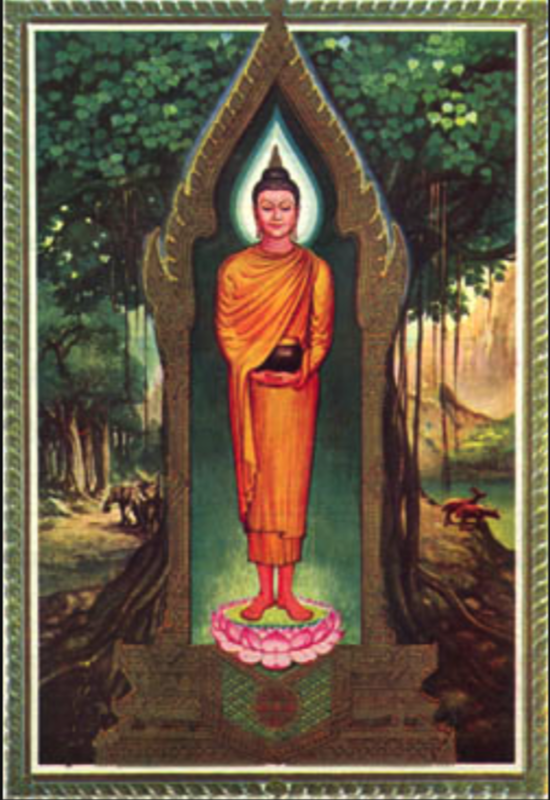 The first time the Buddha travelled to Kapilavatthu (called “Gabinlapat in Thai) after his Enlightenment,, he levitated up into the air, causing the doubtful inhabitants of the City, and his relatives (for this was the City of his birth) to bow down in reverence. He caused a massive rainstorm to flood the area, but where they were sitting was left untouched by the rains. He then told the story of his previous life as Vessantara (called “Prawes Sandorn” in Thai). 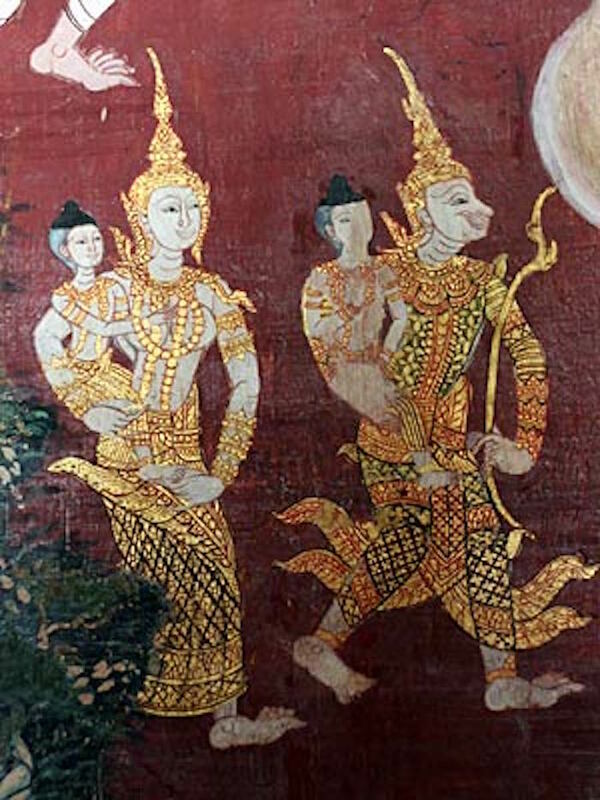 Prince Vessantara gave away all his possessions, including his children to become servants of an evil spirited character. In the end everything turns out right though. This Jataka (Lifetime), displays the virtue of Charity. In the above picture the prince and his wife take their children out of the palace to life in the forest. this picture is in Wat Kongkaram, in the Province of Ratchaburi. 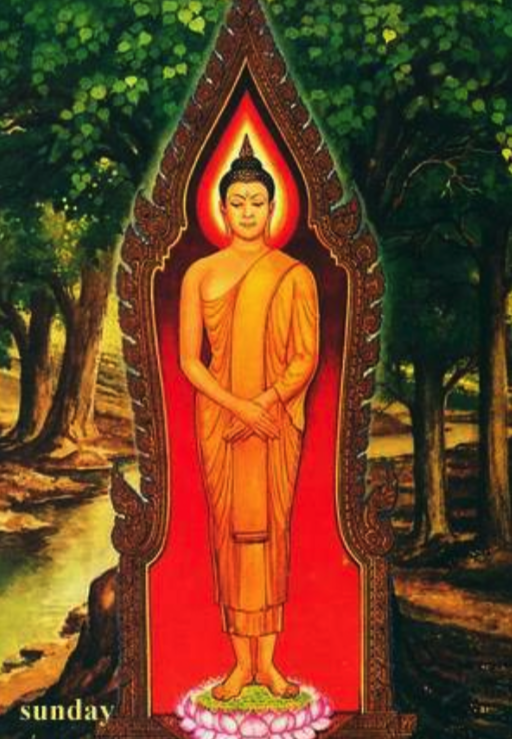 Once the Sermon was over, the King (Buddha’s father), was filled with spiritual bliss (Piti) and raised his hands in reverence to his Enlightened Son, the Buddha. All the citizens of Kapilavatthu followed his lead and raised their hands. His Father made the supposition that because the Buddha was his Son, and used to live there with him in the Palace, that the Buddha would surely come to eat at the palace. So he neglected to invite him to come, thinking that it should be taken for granted. He ordered fine foods to be prepared and laid out in the palace, but when he saw that the Buddha did not appear, he made his second ignorant mistake, supposing that the Buddha must have gone to bring all the other Bhikkhus (monks) to eat too. He thus ordered the servants to prepare a great banquet with food and gifts for the Monks. 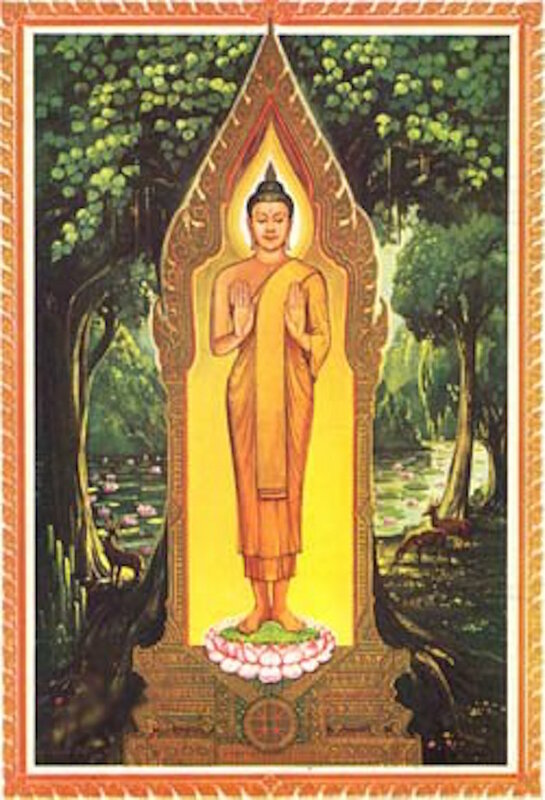 When the Buddha and his “sawaka” (disciples) still did not appear, the King then contemplated the story of Buddha’s previous lives, considering what Buddha had done in those lifetimes, and realised that the Buddha would always take alms on the roadside without any conceit, despit the fact he was a Prince and could eat in his Father’s palace. The Buddha indeed walked along the roadsides of the City to beg for alms, and this was the first time ever that the Folk of Kapilavatthu were able to make offerings to the great Bodhisattva Sakyamuni, and see him in his Radiance. This incident is thus the reason for the creation of Buddha statues , standing holding the almsbowl, and is called “Pra Puttaroop Um Badtr” (Buddha holding almsbowl). This Bpaang is of the Buddha sitting on a rock under a tree and called “Bpaang Welaalai”; His hands are outstretched recieving offerings from two animals. The Elephant is offering him water to drink, and the Monkey is offering him a beehive full of Honey. 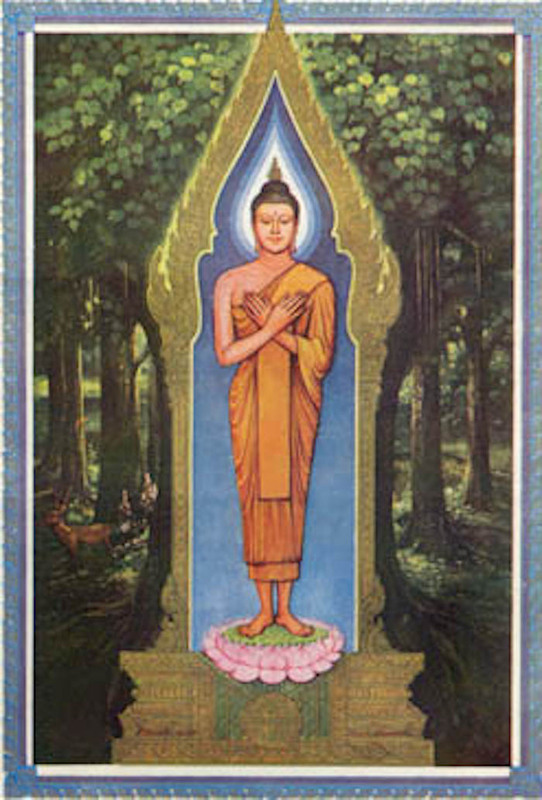 In the City of Kosambi, there were two Bhikkhus staying in the same temple – one of them whose name was Vinayadhara was very faithful to the Vinaya (Buddhist Canonical law of precept keeping), and the other whose name was Dhammadhara, was extremely dedicated to the art of teaching the Dhamma as his main reference of practise. Both of them had a great number of disciples. One day Pra Dhammadhara used the bathing area and forgot to replace the water in the receptacle for bathing and left it nearly empty. When Pra Vinayadhara saw this he scolded Pra Dhammadhara for his negligence. Pra Dhammadhara then apologised and made the necessary prostrations to make up for his negligence. After he had left the scene, Pra Vinayadhara began gossiping with the disciples that Pra Dhammadhara had made a transgression and didn’t even regret it or show penance. When Pra Dhammadhara heard the gossip, he became angry and went to Pra Vinayadhamma and asked him why he was lying about him? Surely it was true that Pra Dhammadhara had already paid his penance and shown regret for his negligence! Why then, should Pra Vinayadhara tell such false tales? The two Bhikkhus began to argue heatedly, causing even their disciples to get involved with the argument. When the Buddha saw this, he went to try to calm the two Bhikkhus, teaching them that peacefulness and mutual support is the way, not to quarrel and disrespect each other and fight. But the two Bhikkhus were so blind that they refused to listen to the Buddha and told him to leave them alone and mind his own business. The Buddha then saw that it was not possible to make them listen, and called Moghalana to help. When Moghalana was also unable to make them listen, the local people lost their faith in the Sangha and threw the Almsbowls over and refused to make further food offerings to Monks. This argument was historical and caused a massive negativity towards Buddhism and the Buddhist faith because of these two Bhikkhus. 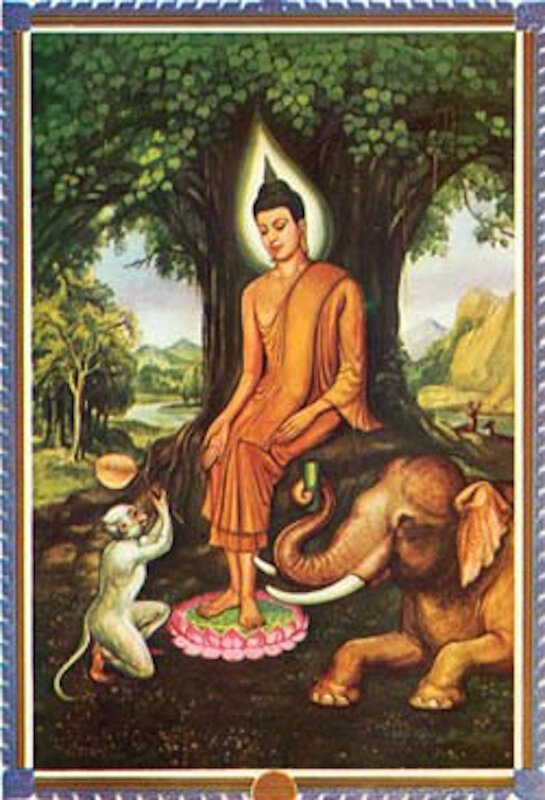 The Buddha entered the forest in total disappointment, and it was there, without any hope of people coming to make any more offerings of alms and food, that the Elephant Parilayaka and the Monkey offered him alms, for there were no people making offerings any more. The creation of this Buddha Image was made as a warning to remember to be Mutually helpful and compassionate to each other, and not to cause trouble and argue, which is directly destructive towards the Buddhasasana. 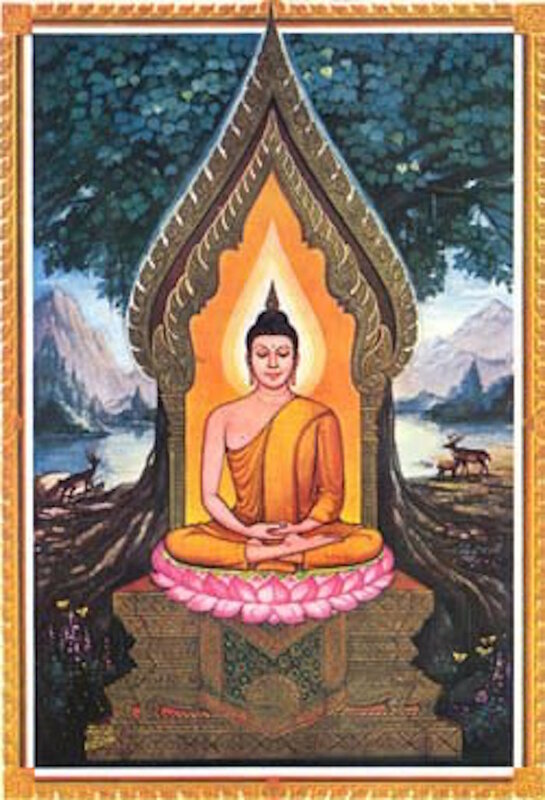 This Bpaang shows the Buddha in Meditation sitting under the Bodhi tree in the place of his Enlightenment. This Bpaang is of the Buddha is callled ‘Bpaang Ramperng” The Buddha stands with his arms crossed over his heart. His feet are placed close together. He considered how difficult it was to undertsand, and the fact that it was almost impossible to grasp for the average mind. He then became a little doubtful that it was worth it to try to explain and teach to Human Beings, and declared to himself that he would not teach the Dhamma to others. At that time, Lord Brahma became aware of what the lord Buddha was thinking, and sent a host of Angels and Deities to go visit the Buddha under the tree he was sitting. They went and paid reverence, and begged the Buddha to please teach the Dhamma to the people. To teach those who have dust in their eyes, and those who are devotees of the Buddha, in the hope that some may attain Enlightenment. The Buddha then took this into consideration, thinking of what previous Buddhas had usually done; namely once they attained Enlightenment, and before entering Nirvana, they would teach and preach the Dhamma and spread it widely for the sake of those who came after them. The Buddha then contemplated whether there could be anyone capable of understanding the Dhamma he had realised, and thought of the various characters and personalities of different people on Earth. He saw there were people with rough coarse minds, average minds, and also fine subtle minds, with good hearts and merits made. Perhaps some of these might indeed be able to attain enough perfections and merits to finally be able to follow the Buddha’s footsteps and attain Enlightenment! He saw some people could be taught easily, some with great difficulty, some could understand, and others not at all. He thus compared them to Lotus flowers that are born under the water and grow in the water; Some flowers remain under the surface, some on the surface, and some rise above the surface. Those people who are like the lotus which has risen above the water and recieves the Sunlight will eventually bloom, and the flower which blooms will also have variations. Some people will attain the realisation of Dharma quickly and easily because they have low amount of cravings and desires, and made great merit in life. Others will attain the Dhammma, but slowly – this type of person should still recieve repeated lessons of the basic principles in order to help condition the character until his practise is safely ensured and constant. This is how the Dhamma should be taught, in order to prevent the Buddha’s teachings to not be in Vain. The basic Dharmic principles should be given to all, with the exception of those compared to the lotus underwater, Soft Lotuses who will eventually become nothing but fish food. At this point, the Buddha declared that he would remain on earth as a living Human Being until the day that the Buddha Sasana was founded and fully established to safley survive the passing of time, for the sake of those Humans who wanted to try to Enlighten. In remembrance of Buddha considering Teaching the Dhamma and establishing Buddhism for the sake of all beings, the Statue of Buddha in the pose of “Bpaang Ramperng ” (consideration) was created. 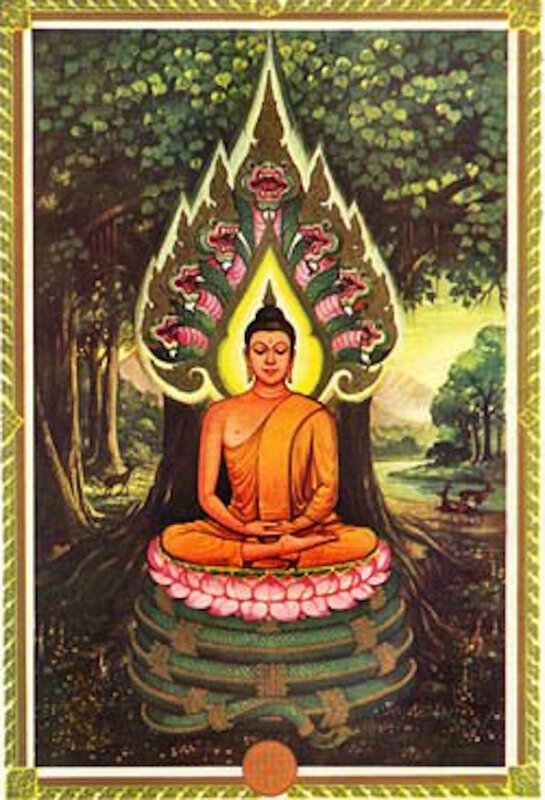 The Buddha remained in blissful rapture under the Acabhalanikaroda for seven days, whereupon he moved to the Mucalinda tree to the Southeast side of the Bodhi tree. A terrible rainstorm began, pouring down on the forest for a whole seven days without stopping. Payanaga Mucalinda, who was King of the Nagas, came up from the naga Realm in the underworld and coiled himself underneath the Buddha, making a cushion seven stories high, to keep him dry. He rose up and leaned his head over the Lord opening his neck canopy to shade the Buddha from the rain, as well as keeping watch to protect him from all sorts of parasitic, poisonous and preying animals and creatures. As the rains ceased to fall, the Naga King uncoiled and changed into a Human form and raised his hands in reverence to Buddha. “Tranquility is the pleasure of he who has listened to and understood the Dharma intently, who sees conditioned things for what they really are, and does not seek to harm others. Of he who has abolished his passions and cravings, lust and desires, he who has stepped beyond all craving for sensual pleasures and endured in his efforts to do away with self conceited attitudes, has the greatest pleasure”.